Jonathan Keates is a distinguished author with many books to his name. An evident passion for Italy is confirmed by the number of books about the country that he has written and, even more so, by his chairmanship of the "Venice in Peril" Fund since 2013. He also has musical biographies to his credit: Handel: The Man And His Music (1985) and Purcell: A Biography (1995). With this latest book he turns once again to Handel, this time focusing exclusively on that composer’s most popular and enduring masterpiece. The book may not go into exhaustive scholarly detail but the scholarship is there alright in the background: Mr Keates has a thorough knowledge of his subject. 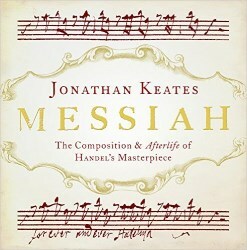 In 161 pages of text he takes the reader through the background to the composition of Messiah, discusses the music and deals with the work's early performance history. Finally he relates how the oratorio nearly sank beneath the weight of doubtless well-meaning Victorian performances on a vast scale before becoming a major beneficiary of the Historically Informed Performance (HIP) movement in the last six decades or so. I was particularly glad to find that Mr Keates gives full credit to Charles Jennens who fashioned the libretto for Messiah. It might be fairer to say that Jennens crafted the libretto for if ever there was an artfully and skilfully constructed libretto for a concert work then this is it. Jennens and Handel had collaborated before – the libretto of Saul (1739) is Jennens’ work – and they would work together in the future. However, Messiah is surely the peak of their collaborative endeavours and the importance of Jennens’ contribution cannot be overstated; apart from anything else it was his presentation of the libretto to Handel that fired the composer’s imagination in the first place. Keates refers to Jennens’ “consummately skilful ordering of his scriptural verses” and he is right to do so. We owe to Jennens the perceptive and discerning structure of the oratorio. The first performance of Messiah took place in Dublin during a series of concerts of Handel’s music that he was invited to present in the city. That much I knew. What I didn’t know – or perhaps had forgotten – was that the composer’s visit to Ireland was as extensive as it was. He sailed to Ireland in November 1741 and did not return to London until August 1742. Keates is very good in his portrayal of Dublin at the time and in describing how the vibrant cultural life of the city intermingled with the political aspect of Dublin society. The premiere in April 1742 was a conspicuous success and Keates outlines the run-up to the performance in a lively and informative fashion. However, the first London performance, in April 1743, was no victory and it was not until 1749 that the work was greeted with approbation in the capital. What really set Messiah on its way, however, was the first of a series of annual performances from 1750 onwards in support of London’s Foundling Hospital: Christopher Hogwood’s celebrated recording of Messiah is based on a scholarly reconstruction of the score as performed at the Foundling Hospital in 1754. After Handel’s death in 1759 Messiah was subject to some well-intentioned but, frankly, perverse performances on a vast scale. The first of these took place in Westminster Abbey in 1784 for which a choir of 257 and an orchestra of 250 was assembled. Such elephantine forces may seem rather ridiculous to us but the results clearly impressed the contemporary audience. Further similar performances followed and I believe I’m right in saying that Haydn attended one such event during one of his visits to London and came away greatly stirred. From 1857 onwards until after the First World War, an annual Handel Festival took place, initially at London’s Crystal Palace. Here too Messiah was given with gargantuan forces and Jonathan Keates is pretty sniffy about these events. He comments that “What was later termed ‘the great Handelian solemnity’ became a vehicle for a certain degree of moral smugness and self-satisfaction …” I sympathise with his view but I wonder if he goes a little too far. These grand performances seem outlandish to us but a more charitable view might be that their scale – and the intention to provide large-scale concerts before a similarly large-scale audience – was in line with the spirit of the Victorian age. That said, I must confess that as a schoolboy I was taken to choral society performances of Messiah in Yorkshire and found them heavy and dull. It was only later when I heard recordings by the likes of The Sixteen and The Monteverdi Choir that the scales fell from my eyes – or ears. It must be acknowledged that even at the time not everyone appreciated these performances of Messiah by big forces. Keates includes a delicious quotation from George Bernard Shaw who railed against the “multitudinous dullness of a Handel Festival” and, as early as 1891, called for Messiah to be sung by “a chorus of twenty capable artists”. It took quite some time but eventually those who realised the need to “go back to basics” won the day and by the late 1950s, as Keates outlines, scholarly musicians such as John Tobin and Watkins Shaw were in the vanguard of the movement to have Handel performed in a manner that was properly respectful of the composer’s original style and intentions. That’s not to say that performances of Messiah by conventionally-sized choral societies have had their day – far from it – but nowadays both professional and amateur performers are more stylish than ever before in the way they approach and perform this great masterpiece. Having related the story of Messiah Mr Keates provides three appendices. The first comprises the full libretto. Appendix 2 lays out Jennens’ Scenic Structure for Messiah. Finally, Appendix 3 is a useful timeline for Handel’s life and times. The book is very nicely produced indeed. The text is set out in an extremely clear font and is accompanied by a good number of well-chosen colour illustrations. Jonathan Keates’ style is clear and lively. He takes the reader with him through well presented, highly readable prose. The book is valuable both as an introduction to Handel’s inexhaustible masterpiece and as a further reference for those who already know the oratorio, either as listeners or performers. I enjoyed this book very much and found it a rewarding read.